A three part look at Winnipeg's International Airports. At 5:10 a.m. on Sunday, October 30, 2011, Air Canada flight AC256 will depart the new James A Richardson International Airport and will usher in a new era for Winnipeg air travel. (There is apparently a ribbon cutting at 11 am). 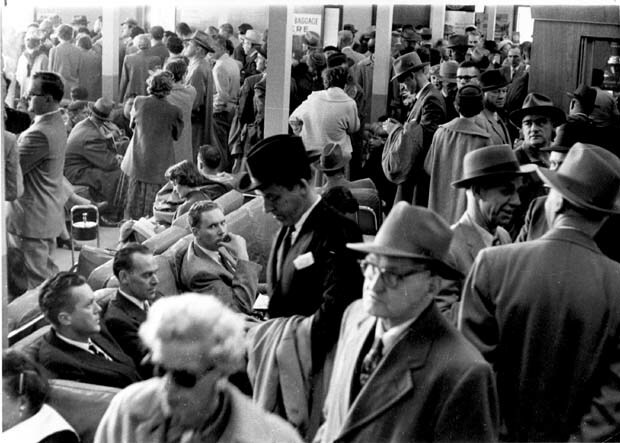 Here is a look back at Winnipeg's airports from 1928 to today. Part 1 looks at what began as Stevenson Airfield, part 2 looks at the recently closed Winnipeg International Airport terminal. Winnipeg's first official airport was Stevenson Field (or Stevenson Aerodrome). 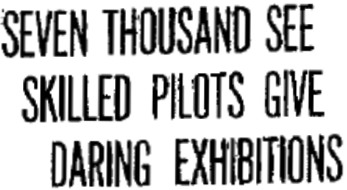 It was opened by the Winnipeg Flying Club on May 27 & 28, 1928 in the R.M. of St. James. Compared to this Sunday's affair, the opening ceremony was a wild ride ! Dozens of stunt pilots from across Canada and the U.S. converged on Winnipeg to put on a two-day show the size of which Winnipeg hadn't seen before. It attracted stars of the stunt-flying world such as American Charles"Speed" Holmon, who held numerous world records, including one for the most loop-the-loops, (his 'day job' was chief pilot for North West Airways). 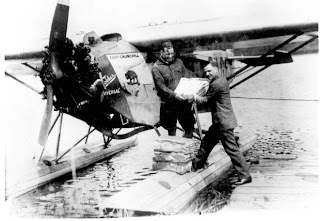 Stevenson loading his plane (source). The airfield was named in honour of Captain Frederick J. Stevenson. 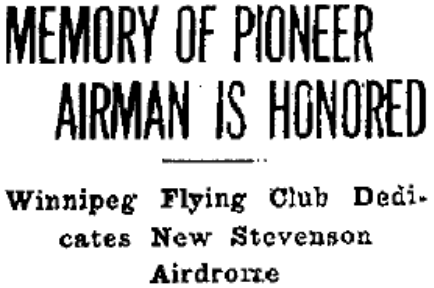 Stevenson, raised in Winnipeg, became a decorated pilot during World War I. Upon his return he worked as a bush pilot and a test pilot for newly developed aircraft. In 1927 he was awarded the Harmon International Trophy for his contributions to the field of aviation*. 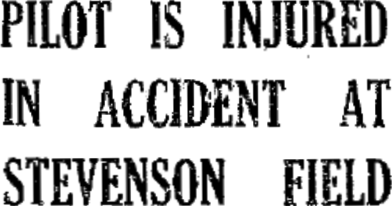 Stevenson died when the plane he was test flying crashed at The Pas in January 1928, just months before the airfield opened. Upon his death he added another to his list of firsts: the first pilot to be killed in a commercial flying accident in Canada, (source). 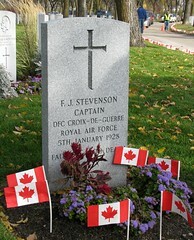 Stevenson is buried in Brookside Cemetery. If you visit his grave you will notice that it is situated differently than those surrounding it. That's because it was arranged that his headstone would face the soon to open airfield that would eventually be named for him. 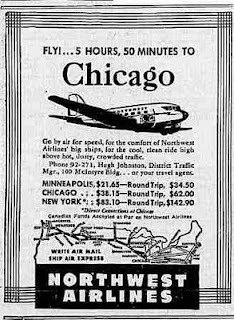 A significant first for Stevenson Field came on February 2, 1931 when Northwest Airways began international flights of both passengers and mail between Winnipeg and Pembina, North Dakota. It made Stevenson Field Canada's first international airport. From the time it opened, the area around Stevenson Field was a buzz of activity. Commercial and military hangars sprang up as did training schools and support industries. There was also the constant upgrading of infrastructure, from runways to roads, needed to service them. Not a lot of thought was given to the comfort of waiting passengers. "Passenger Terminals" were just a lean-to next to the hangar. In 1931 the Western Canada Airways hangar, said to be the largest west of the Great Lakes, burned down after barely a year of service. In the plans for a new hangar, architect Arthur Stoughton incorporated a separate passenger waiting area that housed a ticket office, customs office, post office and other amenities. 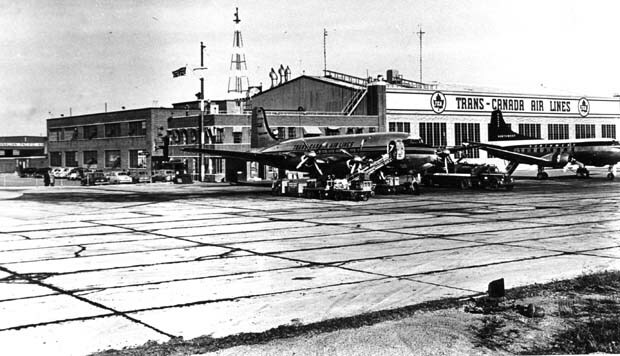 In 1936, Trans-Canada Airlines was formed and a new hangar was constructed (the present home to the Western Canadian Aviation Museum) and that is where the main passenger waiting area went. In December 1952 a special-built passenger addition was made to the TCA hangar. 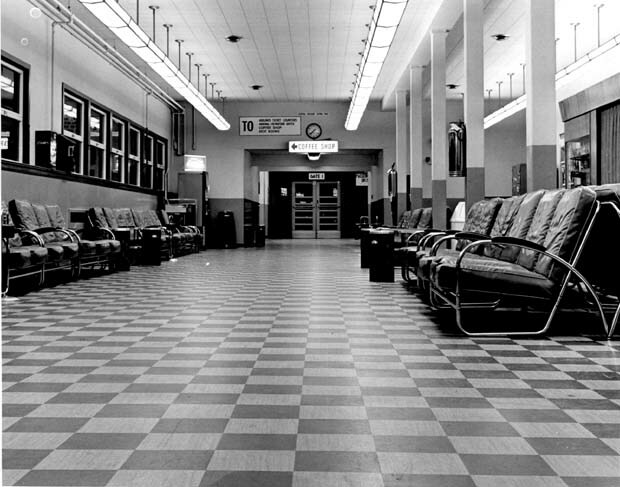 It had a bus depot looked to it as well as some of the same amenities like a coffee shop and even baggage carousels. Though the new waiting area eased some of the congestion, it was clear that more needed to be done. Airlines using the airport included Trans-Canada, Canadian Pacific, TransAir and Northwest. It was also a crew change and refueling stop for some international Scandinavian Air and Pan Am flights. Aside from civilian traffic, Stevenson Field also had to deal with the largest number of military flights of any civilian airport in the country. It was also home to numerous civilian and military flight training centres. Despite the heavy traffic and large number of novice flyers, Stevenson Field had an excellent safety record. In the vicinity of the field crashes were rare and usually meant damaged planes rather than death. 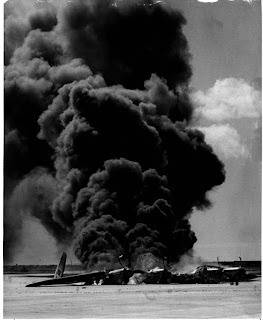 Even in this spectacular 1950 Lancaster accident, which crashed on take-off, all 11 crewmen escaped. The only people that could argue with the safety record were residents of the City of St. James' College Street (after amalgamation renamed Collegiate Street). 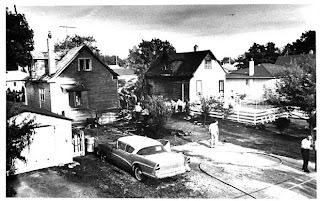 In 1950 an RCAF de Havilland Vampire crashed into the back yard of a Collegiate Street home killing the owner and seriously injuring the pilot. In February 1957 a Mitchell Bomber crashed onto Collegiate Street just 500 metres from the runway. It damaged several homes but the body of the plane came to rest in an empty lot. Nobody was killed. 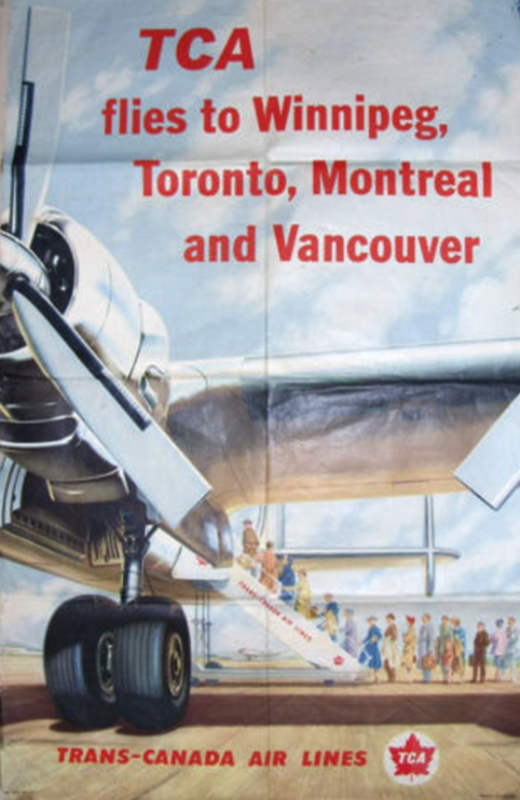 By the mid 1950s the jet age had arrived in the budget estimates of Ottawa, who ran most of the country's airports. Tens of millions of dollars were spent each year to upgrade runways and to build new airport facilities. In 1957 it would be Winnipeg's turn. Architects Russell, Blankstein were appointed to create plans for a new air terminal and administrative centre. The location would be the existing Stevenson Field area, home to so much existing air industry infrastructure and now surrounded by a lots of post-war surplus land owned by various levels of government. In preparation for the changes to come, in 1958 title for the lands were transferred to Transport Canada (who would now run all major civilian airports in Canada) in 1958 they requested that the name of the existing facility be renamed the Winnipeg International Airport. Very in depth. Looking forward to part 2. Excellent post. Reading about Frederick J. Stevenson makes me wonder if there shouldn't be some thought given to memorializing him in the new terminal seeing that the airport was originally named after him in the first place. It is too bad that they didn't carry forward the tradition. Maybe they still have the bus kicking around somewhere in the basement ! Would you be able to steer me in the direction regarding prewar and WW11 history regarding the aircraft hangars such as Hangar 6,7 or 8. Hangar 6 & 7 being off 33 Allen Dyne Rd. Any information on that area would be appreciated. Lots of '404 Page Not Found' errors on Part I of Winnipeg Airport history. Thanks, James. The post is about 7 years old now so pages i linked to may have moved or shut down. I'll put it on my list to update.